Enjoy superior shadow rejection and sky condition tolerance using the DynaTrack's Blue-Track technology. Coupled with the DynaVibe GX3 balancer, our single-operator system is efficient, accurate, and affordable. The DynaVibe GX3 and DynaTrack accessory measures up to two channels of vibration plus blade track and logs results from up to 8 flight conditions per flight. Built-in setup information for most helicopters. Simple setup. Simple menus. Clear measurements. Frustrated with the track and balance process? The GX3 has minimal menus, is easy to set up, and gives clear vibration and track readings when used with the DynaTrack optical blade tracker. The DynaVibe GX3 has multiple modes to help you balance main rotors, tail rotors, and other rotating components. Easy setup, acquisition, and result logging for up to 8 flight conditions per flight. 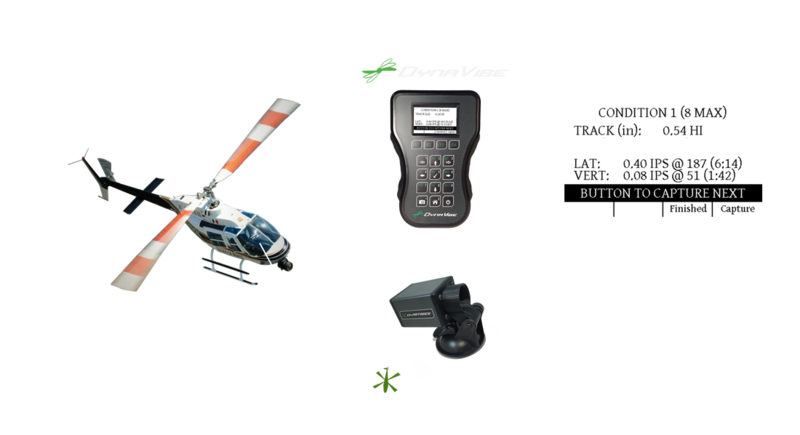 Acquisition can be triggered by the pilot using a remote push-to-talk button, enabling single pilot/operator operation. Optically track main rotor blades using the DynaTrack accessory (sold separately or as part of a kit). Simultaneously acquire blade track and ship vibration while measuring in a hover or forward flight. The DynaTrack accessory adds optical blade tracking capability to the DynaVibe GX3, seamlessly integrating blade track measurements while using the DynaVibe GX3's Rotorcraft Mode. Optically track blades on the ground, in a hover, and in forward flight. The DynaTrack is an optical tracking accessory for the DynaVibe GX3 and works with the GX3's Rotorcraft Mode to add optical blade track measurements. The DynaTrack's built-in helicopter library automatically configures the system for many common models. Other rotor systems can be input simply by entering the blade chord and diameter. The DynaTrack's BlueTrack technology reduces interference from shadows and uneven sky conditions, making optical blade tracking faster, easier, and less frustrating. Remote push-to-talk button operation enables track & vibe acquisition with a single pilot-operator. Tracking and balancing a Robinson R22 Helicopter using the DynaVibe GX3 and DynaTrack Optical Tracker. Main rotors, tail rotors, shafts, & accessories. ​" It is amazing how smooth my Safari is after using the DynaVibe & DynaTrack. I'm averaging 0.05 IPS in forward flight! :) :) :) :)"
Can I track & balance with just the DynaVibe GX3? The DynaVibe GX3 has a Rotorcraft Mode that can be used with or without the DynaTrack Optical Tracking System. When using the DynaVibe GX3's Rotorcraft Mode, the DynaVibe acquires up to 8 sets of vibration and track data. If a DynaTrack is not detected then the DynaVibe just acquires vibration data. Do I need a DynaVibe to use the DYnaTrack? Yes. The DynaTrack is an accessory for the DynaVibe GX3 that adds optical blade tracking capability. Can The Dynatrack be used with a Classic or GX2? The DynaVibe Classic is not compatible with the DynaTrack accessory but we do offer trade-in credit if you wish to upgrade to a DynaVibe GX3. Call us for details. If you have a DynaVibe GX2, it can be upgraded at no charge to a DynaVibe GX3 when you purchase a DynaTrack. Depending on the age of your GX2, the hardware may or may not need to be returned to the factory to complete the upgrade. How does the DynaTrack mount? The DynaTrack is mounted to the windscreen with a convenient suction mount. The mount itself is removable and custom mounts can be easily fabricated by the user if needed. Will the system work with my helicopter? The DynaVibe GX3 and DynaTrack can be used on most helicopters and we are constantly adding new application notes for each type of ship. Contact us for more information! ​" I used the DynaVibe GX3 and DynaTrack on 2 ships down at the Fly-In. Works slick!" Are you looking for information on tracking and balancing a Robinson R22? Check out our R22 Track & Balance page for a description of the process.